More and more anglers from across the country are heading over to fish the North Bank of the River Nene as next month’s Division Two National on the venue draws ever closer. The weekend’s National Practice Open run by Peterborough & DAA covered D and E sections and once again bream made up the main frame weights with the roach not showing in the expected numbers. 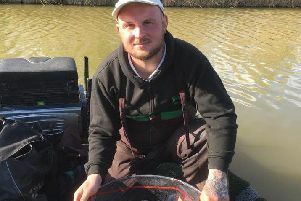 Matchwinner was John Locke, who landed 18 bream for an excellent 79lb from a peg in the middle of the match length. He caught using feeder and worm tactics to land bream to over 7lb. Second was Ian Turner with another feeder-caught bag of bream totalling 55lb 3oz and next came Danny Vaughan with 20lb 4oz and England veteran team member Colin Perry with 18lb 6oz. Peterborough & DAA are running further opens on Sunday August 26 and Sunday September 2. To book in contact pdaabooking@outlook.com or ring 077024 40892. Once again the bream showed well for those fishing the latest Peterborough & DAA/Ringers Series match on Ferry Meadows. Top rod was bream expert Phil Ringer, who caught on long range feeder tactics from peg 45, weighing in 53lb 8oz. Geoff Grant came second with 48lb, followed by city rod Nigel Briggs on 39lb 8oz. The last round of the Fenland Feeder Pairs series took place on a very difficult section of the North Bank on Sunday. This match was not the best to say the least and unfortunately the full results have not been handed in. But I do know that Alan Palmer and Dave Williams were leading going into the match and no-one managed to catch them.